Editors: Li, Kuan-Ching, Jiang, Hail and Yang, Laurence T., et.al. Presenting the contributions of leading experts in their respective fields, Big Data: Algorithms, Analytics, and Applications bridges the gap between the vastness of Big Data and the appropriate computational methods for scientific and social discovery. 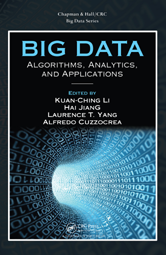 It covers fundamental issues about Big Data, including efficient algorithmic methods to process data, better analytical strategies to digest data, and representative applications in diverse fields, such as medicine, science, and engineering.